This is a the first pie crust of the season here on Glen Road. Even though pies can be made any time of year, it seems we prefer pie more in the Fall and Winter seasons. Our first pie is always made around Halloween and this year is no exception. Making pie crust dough always brings about a little bit of anxiety for me. No matter how many times I’ve made a crust, I am always nervous about the part of picking up the rolled dough and placing it in the pie plate without tearing or ripping the dough. Even though I’ve made lots and lots of pies, I can’t ever seem to shake my crust anxiety. That’s why it is important to find a crust recipe out there that works for you. There are many….ones that use butter versus vegetable shortening, ones that use sugar versus salt, ones that use a pastry blender and ones that don’t. Experiment with the many recipes out there until you find one that works for you. Once you determine the right one, stick to it. The more you use it, the easier it will be to make a crust that is flaky and golden. Like they say, practice makes perfect. Pulse flour, salt and sugar in a food processor until combined. Add butter and process until mixture resembles coarse meal, about three pulses of the food processor (remember, your butter is already in small pieces so you don’t want to chop it up much more). With the machine running, add water in a slow, steady stream until mixture just begins to hold together. 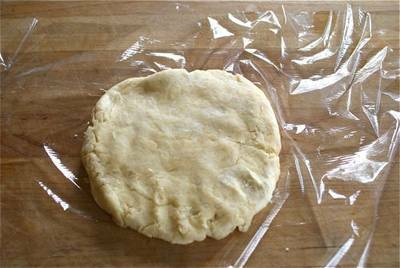 Shape dough into 2 disks. Wrap each in plastic, and refrigerate at least 1 hour to 2 days (or freeze for up to 1 month; thaw in refrigerator before using). Like I said earlier, everyone you know has a different technique for making pie crust dough. I like the easy technique the food processor provides. 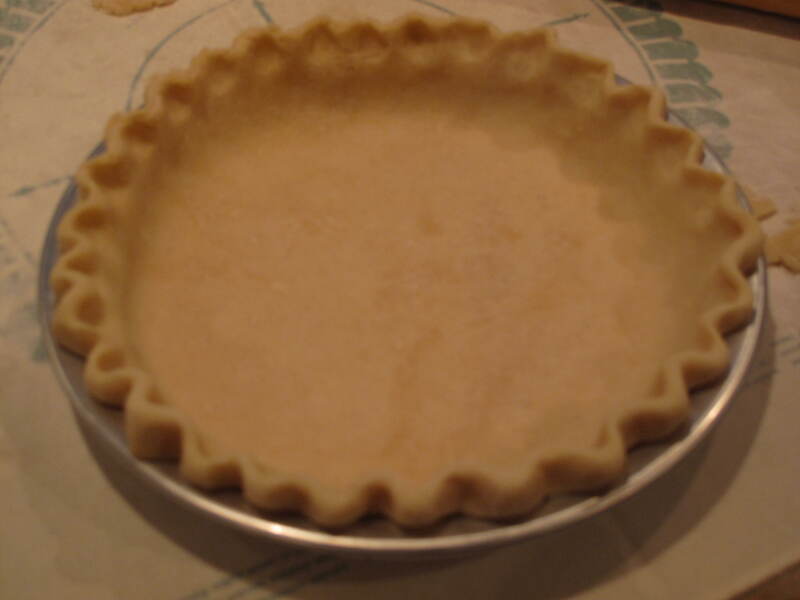 My friends over at Rufus’ Food and Spirits Guide make their pie crust dough with a pastry blender. The choice is yours. At the end of the day, you want a recipe that provides delicious, flaky and golden brown crust that you enjoy eating. Also experiment with the edges of your pie crust. There is nothing more beautiful than a pie with a gorgeous finish on the edge of the crust…whether its a simple fluted edge or one decorated with cut-out dough shapes into forms like leaves, hearts or flowers, that attention to detail makes a good pie a great one. Have fun making your crust and don’t get nervous…like me. 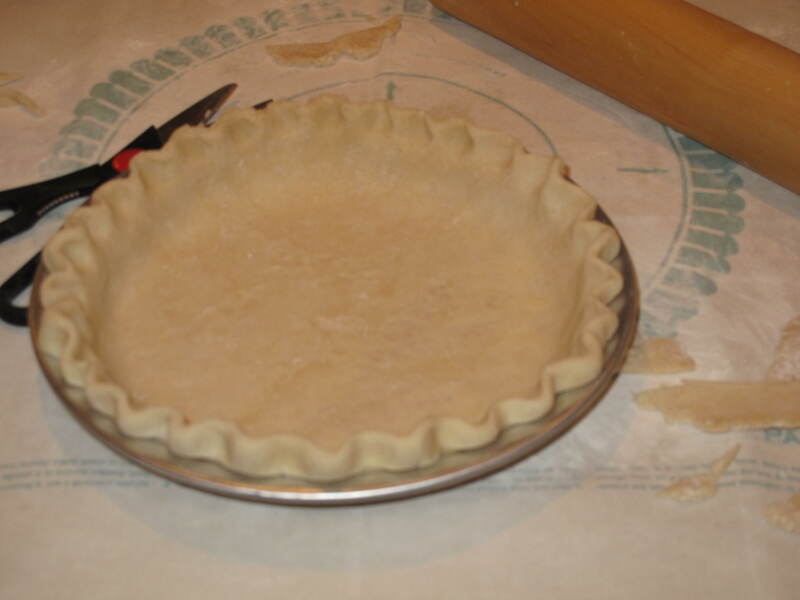 How do you make your pie crust dough? This entry was posted in Food and tagged Acorns, Baking, Beauty, Blog, Cooking, Dessert, Fall, Family, Food, Fun, Life, Lifestyle, Love, My Life, Photos, Recipes, Thoughts. Bookmark the permalink. that is a gorgeous pie shell!!! and the recipe looks so easy! Mind if I link you one of these days? Hi bombshellbettytobe. Welcome to Acorns On Glen. Glad you liked the recipe and feel free to link to me. Appreciate the compliment! Come back and visit soon. That first picture says it all, what a great pie shell! Thanks for the shout out. I love fruit pies in the summer, but I hate heating up the house. I love fall pies. Hi Greg. Thanks for the comment. Had to link to your recipe….looks like a beauty. Come back and visit soon. Great sounding dough. Sounds very simple – which is the best way. I did one myself not long ago. Hi frugalfeeding. Welcome to Acorns On Glen. Yes, my recipe is very simple. I found it about 10 years ago and have stuck to it. Seems to never disappoint. How did the crust you made turn out? Come back and visit us soon.